A virtual reality project at North Carolina State University is giving engineering students a safe space to explore the cultural assumptions that color global communication. Students wear VR headsets to experience scenarios where cultural differences impact the way people communicate. In an era ripe with mistrust and fear, it's easy to set empathy aside. But what if we could step into the eyeballs of another person to get his or her point of view from the inside? Could that lead to greater understanding? That's the idea for a project at North Carolina State University that uses virtual reality to help engineering students understand different cultural perspectives. 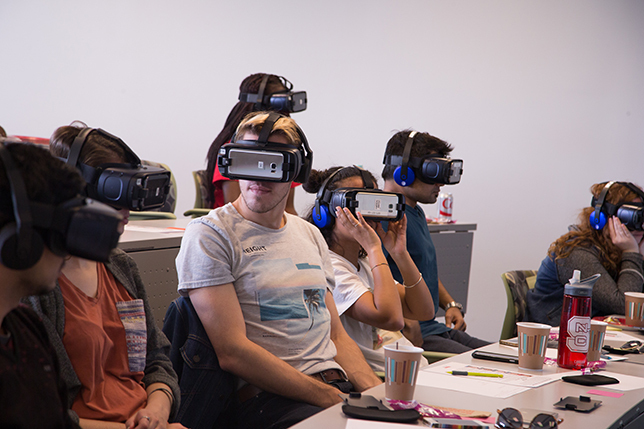 As part of a two-hour workshop, students pop on a virtual reality headset (most recently, that's the $199 Oculus Go) and attend a virtual meeting that brings together a small group of people from the United States, China, India and Singapore. In the opening scene of "First Impressions," the user observes a global business meeting taking place in an office in China. It's apparent as the meeting progresses that the interactions among the various characters are leading to tensions. All of the students see the same thing, remove their headsets and go through a bit of discussion. 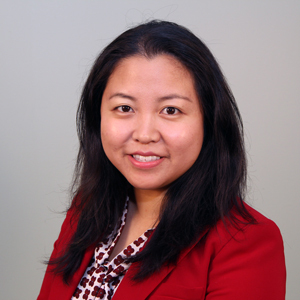 They're asked simply to be observers first, "and not apply any judgment to what's going on," said project lead Ilin Misaras, assistant director for the university's Global Training Initiative (GTI). "Don't tell me that [somebody] is weird. Tell me what he said." Following that, the headset is pulled on again to watch the same scene repeated. But this time, each user has been assigned to one of three people in attendance at the global meeting and assumes his role from a first-person point of view. At several points during the meeting, the action stops and the user hears the thoughts of this "alternate self." For example, in one cringe-worthy moment, one of the Americans suggests working through lunch instead of hitting the host's favorite local restaurant, while another American declares that he "loves Chinese take-out." The host's conclusion: "I don't think this company will be a good partner for us. They don't seem to know what they're doing and are extremely rude to the people who work with them. They don't even understand the importance of having a good meal together." What those stop-action vignettes reveal, according to Misaras, are the cultural assumptions present in the communication. The discussion that follows then focuses on what the individual characters were thinking. "It's a safe space. They're all fake characters, so you're not offending anyone," explained Misaras. GTI found that it was helpful for students because they were forced to "take a step back and say, 'OK, maybe there's something cultural going on here. Let me think about some of these values and dimensions that I've learned about. And then let me try to think about it from that point of view.'" The project originated when the university's Distance Education and Learning Technology Applications (DELTA) unit issued GTI a grant for the "innovative use of technology." GTI is a unit of the institution's Office of Global Engagement. Its main purpose: to tackle short-term projects for students, faculty and staff and develop custom training for international and local professionals. Teaching cultural competency has long been a part of GTI's programming (unit members are certified as Berlitz cultural orientation approach practitioners), but the group was ready to move beyond text- and cartoon-based training for some of its scenarios. After a lot of brainstorming for this "side project," as Misaras called it, GTI settled on the idea of creating 360-degree videos. She wrote the script, and DELTA Creative Director Michael Cuales concocted a custom rig with three cameras to do the filming. All aspects of production were handled in-house. 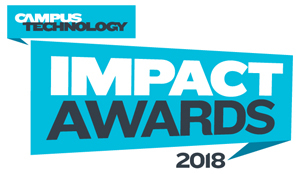 Among the technologies involved: Kolor's Autopano Video software for processing the raw 360 video array; Adobe Creative Suite for editing, masking and rendering final video content; WondaVR for the development of interactive 360 video experiences; and Moodle for delivery of the course module. The work was started in fall 2016 and finished for piloting by students in spring 2017. A custom camera rig allowed the team to shoot 360 video from a first-person perspective. For this first campus VR project, the university acquired about a dozen Samsung GearVR headsets and requisite phones, which meant the testing could only be done with smaller groups. 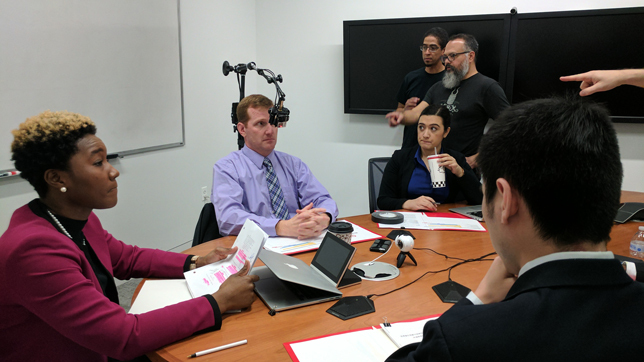 That setup also turned out to be a limiting factor, since faculty and assistants had to grapple with technical issues that popped up with that combination of devices. Since then, the school has purchased a classroom-sized inventory of phoneless Oculus Go headsets, which is expected to minimize the amount of technical dinking required and will allow GTI to scale usage. That's timely because although the original use was among engineering students, GTI is seeing interest percolate in other disciplines too — starting with the school of business, which wants to use the training as part of the orientation for new MBA students. The resulting experience gives students a sense of visual and audible presence that differs from traditional media forms. That's why Misaras considers the use of VR so important to the effort. "There's an element of novelty, of course. It's a new technology so it's really cool [and] that gets them in the door," she admitted. "But I think the virtual reality helps with building empathy because you're experiencing the meeting through someone else's eyes and you're hearing their thoughts. You become that person, even if you don't agree with what they're thinking or saying, even if that's not what you personally hold as your point of view. We found that students will tend to argue that point of view more. What we've heard is, 'I don't necessarily agree with this guy and what he's thinking, but I get it. I understand his reasoning now.'" The use of VR for this kind of scenario-based experience could have application outside of school too, Misaras observed, where people need to have real conversations with each other: "OK, I might not agree with you politically, but instead of calling you a stupid idiot, let's figure out, what were your experiences? What brought you to your beliefs and how you see the world? What are your values? It's not just for engineering or business. It's for any kind of relationship building."